Josh Sweat has an impressive get-off at the snap. 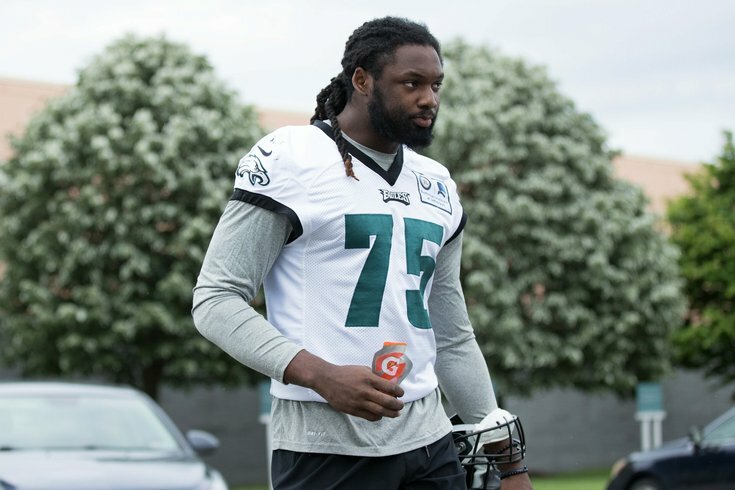 On Tuesday, the Philadelphia Eagles kicked off their final three days of practice, a mandatory mini-camp, before they break for the summer. As always, we have notes. • The Eagles had full participation, as Darren Sproles and Michael Bennett made their first appearances of the spring. Sproles didn't do much of anything, as he is still recovering from a torn ACL suffered in September of last year. Bennett played DE with the second-team defense, as Derek Barnett and Chris Long remained with the ones. • Carson Wentz had a highlight reel play today. In a red zone 7-on-7 session, Wentz fired a laser shot through traffic that juuuuuust snuck by Ronald Darby into the hands of Nelson Agholor, who made a great catch on the play. As we noted back in January using the NFL's 'Next Gen' stats, Wentz was the most aggressive quarterback in the NFL last season, as he ranked highly in terms of throwing into tight windows, willingness to throw past the sticks, and get ready for it... air yards! That has not changed this spring. Even with a torn ACL and LCL, Wentz is still able to put major velocity on his throws. It's really impressive. On the downside, Wentz did get picked by Rodney McLeod on a ball that he tried to force into an even smaller window in the red zone. • Nate Sudfeld had a play that I liked today. He fielded a low-and-away snap that he probably shouldn't have been able to handle, then immediately spun away from an oncoming rusher. While rolling to his left he threw on the run about 25 yards down the field, with some heat on it, to Dallas Goedert along the sideline. While the pass was incomplete, Sudfeld was able to put it in a place where Goedert at least had a chance at it. Sudfeld's athleticism has been surprising good. • Recent free agent signing Markus Wheaton made more than a handful of catches today. The signing of Wheaton reminds me a little of when the Eagles brought in guys like Reuben Randle, Chris Givens, and Dorial Green-Beckham, in that those guys each had some level of previous success with their old teams before joining the Eagles. To be clear, I'm certainly not comparing Wheaton's intelligence to Randle or DGB. The difference between Wheaton and Randle or DGB is that Randle and DGB got a whole lot of attention because the Eagles didn't have jack squat at receiver. Because the Eagles actually have some nice pieces now at wide receiver, Wheaton is more of an afterthought, as opposed to player who is being projected to start out of sheer necessity. Randle and DGB figured they were both locks to make the roster (Randle never made the 53), while Wheaton is not guaranteed a roster spot at all. In Wheaton's contract season in 2016, he had a lingering shoulder injury and was placed on IR after appearing in only three games. During the 2017 offseason, Wheaton signed with the Chicago Bears on a two-year deal worth $11 million, and $6 million guaranteed. The Bears didn't get their money's worth. Wheaton had an emergency appendectomy in training camp, and struggled with finger and groin injuries, though he did appear in 11 games. He was released after just one season. It will be interesting to see how Wheaton plays during training camp. He has a chance to crack the roster if he's healthy again. • Linebacker Kamu Grugier-Hill seems to be getting a lot of reps with the ones. There are three players competing for that third linebacker spot this spring after the release of Mychal Kendricks. They are Grugier-Hill, Corey Nelson, and Nate Gerry. Nelson's specialty is in coverage, while Grugier-Hill and Gerry were both safeties in college. It's pretty clear what the Eagles are looking for in their backers by now. • De'Vante Bausby continues to get reps with the ones. He has clearly emerged as the surprise guy of spring camp. • I've been impressed by rookie DE Josh Sweat early on. We noted previously that rookie OT Jordan Mailata struggled mightily trying to block him during OTAs. That continued today, but I tried to ignore that aspect of it, as Mailata isn't going to block many players in this camp, seeing as he's just learning the sport. Results aside, Sweat's get-off at the snap is explosive. Those don't appear to be a fluke. Sweat will have to prove that his knee is can withstand the beating it will receive at the NFL level, but he has shown that he has talent.